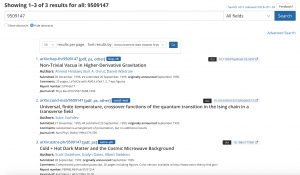 This morning we released v0.4 of the arXiv search application. Here is a quick run-down of bug-fixes and new features introduced in this release. 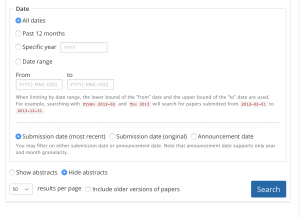 We received quite a few requests for the ability to disable abstracts in search results. We went ahead and added the feature, which is provided in both simple and advanced search. Your last selection is “sticky,” so that you do not have to take specific action to disable or enable it every time. We introduced a feature that allows users to disable abstracts in search results. We do support searches by arXiv paper IDs, including partials on new-style paper IDs (e.g. 1802). But we got a few requests from users who wanted to be able to enter the numeric part of old-style semantic paper IDs. For example, searching for 9509147 should yield astro-ph/9509147, cond-mat/9509147, etc. This is now fixed. 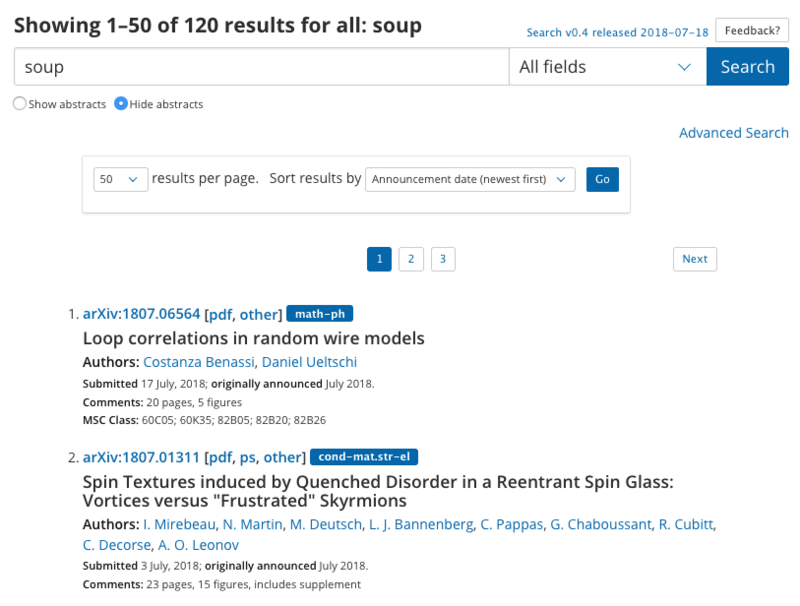 You can now search old-style arXiv paper IDs without their semantic prefix. We added a little more functionality to the date-filtering part of the advanced interface. You can now choose to filter on the submission date of the current version or the original version, or on the announcement date. We added some new options for date range filtering in the advanced search interface. 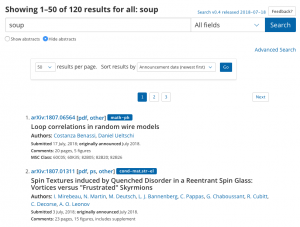 In an earlier version of search, we noted that the legacy arXiv data model presented some challenges when it came to providing a precise set of results for a specific author. It is important to note that the current search system is in no way less precise than its predecessor. One thing that made it seem that way, however, is that links from authors names (e.g. on the abstract page) were no longer limited to the archive in which the paper indexed. The change was creating enough confusion and consternation that it seemed to outweigh the benefits of the broader search, so we restored the classic behavior. When you click on an author name (e.g. on the abstract page), search results are now limited by archive. You can click “Search in all archives” to expand your query. Clicking on an author name in an hep-lat paper should only return results from hep-lat. You can bookmark archive-specific search URLs, e.g. 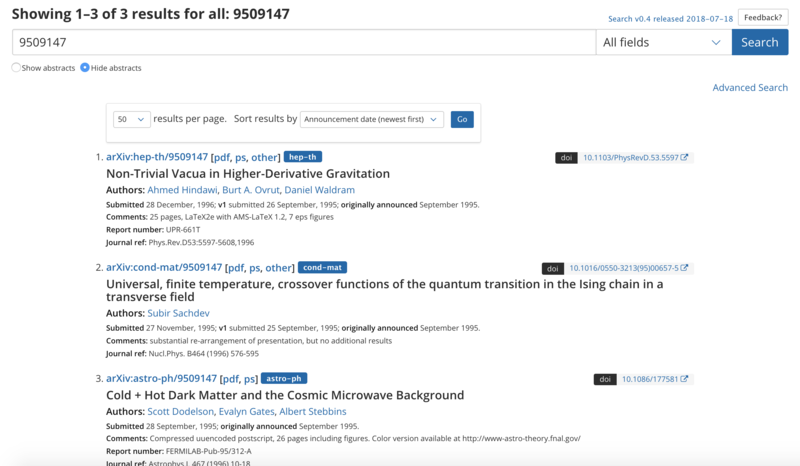 https://beta.arxiv.org/search/cs (this was already available in the advanced interface; we just added it for simple search as well). These were available via the search box in the header, but were not present in the simple search form. We went ahead and added them. We decided not to add them to the advanced search, since they cannot be used in a combinatorial fashion like other options (they are entirely different platforms). We let our Python show a bit in early versions, and made the upper bound of date range queries in the advanced interface exclusive rather than inclusive. This is now fixed, so that date ranges are always inclusive (i.e. 2016-2018 includes papers in 2018). Some users were uncertain about how to go back and change their queries. We tried to make it a little more obvious by adding some buttons in the upper left corner. We added buttons to “refine this query” and “start a new search” in the upper left corner of the page. Fixes to collisions between hit highlighting and MathJax rendering. Particularly in the math domain, we were noticing quite a few equations that were getting mangled by search term hit highlighting. These are now fixed. A discrepancy in how author-owner names were being searched with and without a comma delimiter has been fixed. Author names were not parsed correctly when they are separated by both commas and the word “and”. For example, author strings like Jane Doe and, Joe Bloggs were throwing our name parsing routine off a bit. This has been fixed. Unexpected errors were being thrown in a limited number of wildcard searches; this is now fixed. Several minor fixes to correct unexpected errors.